Koenigsegg CCX Supercar VS Nissan GTR Racing Battle! - Muscle Cars Zone! Koenigsegg CCX Supercar VS Nissan GTR Racing Battle! Powered by a twin-supercharged 4.7L V8 engine delivering 806HP at 7000 RPM and 679 pound-feet of torque at 5500 RPM, the Koenigsegg CCX Supercar is a real monster! In fact, it can go from 0 to 60 in just mere 3.2 seconds, and to 124mph in just 9.8 seconds. It can also reach a top speed of 245 mph which is absolutely mind-boggling. Keeping that in mind, you would bet all your money on the Koenigsegg CCX supercar to completely annihilate any possible car it can encounter on the street. Although, in Turkey things went a bit awry for this powerful supercar. 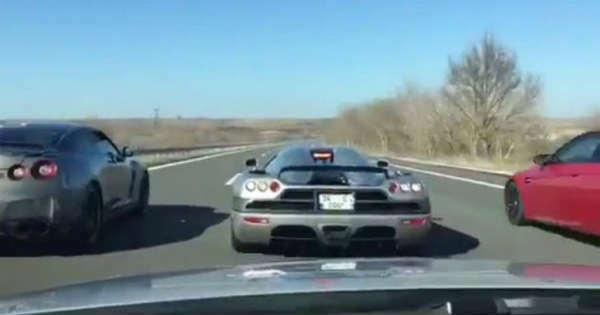 A silver Koenigsegg CCX supercar was filmed street racing a seemingly inferior Nissan GTR on a highway. It was all filmed from a camera in a Mercedes-Benz AMG E63 and this Mercedes driver had the life of his time watching a GT-R beating the all mighty CCX. The Nissan GT-R is not only seen taking off quicker yet continuing to raise the gap before the driver in the CCX backs off at around 186 mph. Given how famous the GT-R is for tuning and modifying, there must be one god-mode engine lurking inside and some hefty drivetrain modifications as well. This GT-R must have around 1000HP at its disposal.